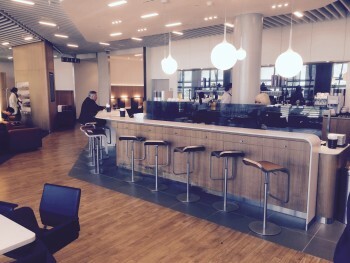 This is my review of the Lufthansa lounges at London Heathrow Terminal 2. My tour of Heathrow Terminal 2 two weeks ago took in the Singapore Airlines First Class lounge, the United First Class lounge (review to follow) and, finally, the Lufthansa lounge. 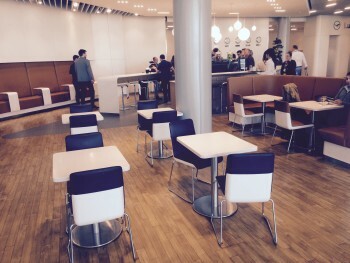 Unlike the other two facilities, the Lufthansa lounge is in the main terminal. If you are flying on a Star Alliance carrier from there, especially short-haul, it is your only option. The other lounges in 2A are the Aer Lingus lounge (also used by Little Red) which I reviewed here and the Plaza Premium (Priority Pass etc) lounge I reviewed here. To be honest, unless you have a long layover, you are unlikely to want to walk over to the satellite terminal to try out any of the lounges there. It is a long way. 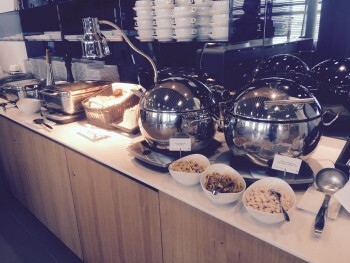 Apart from the First Class Terminal in Frankfurt (review) and the First Class Lounge in Munich (review), Lufthansa lounges don’t really ‘do it’ for me. 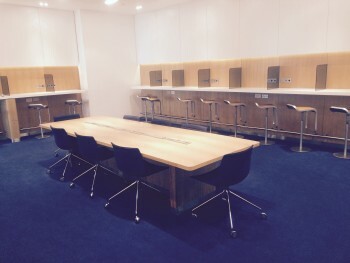 There are very utilitarian – plain walls, functional chairs and tables, large open spaces. There is nothing to make you feel special, in my view. That said, there is nothing wrong with what you get and the daylight is excellent. 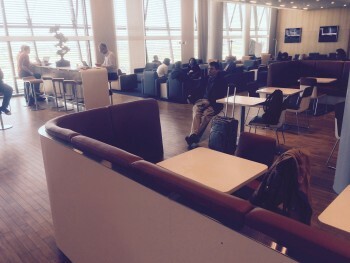 There are two lounges – one for silver / Frequent Traveller card holders and business class passengers, and a Senator lounge for Gold card holders and anyone connecting to a First Class flight. Slightly oddly, to get to the Senator lounge you must walk through the business lounge. There were some decent looking hot dishes as well. 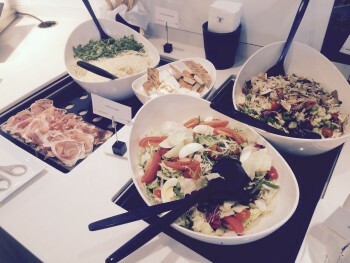 You won’t starve or go thirsty in either part of the Lufthansa lounge and I would be perfectly happy to use it on a regular basis if I was shuttling between Germany, Austria, Poland, Croatia, Switzerland or Scandinavia and the UK with a Star Alliance carrier. All it lacks is a sense of occasion. I’m guessing this would have been branded the bmi lounge if it hadn’t been sold. Shame the design and furnishings hadn’t been done in bmi style, the lounges in T1 (now BA owned) have a much nicer feeling than this. Could always launch a campaign to have the furnishings changed to match the way things had been done previously under a previous ownership? If they don’t change them to suit your needs then we will know that Lufthansa is a company which doesn’t listen to its passengers – even if they took a commercial decision to pitch them at the level they have done. They are unfiltered! You massively over-estimate my tech ability. It was very sunny and one wall is glass. Hmhm – are you SURE they are unfiltered? The Radisson SAS photos look equally washed out? Are you taking photos with the stock camera app, or directly in Instagram / Facebook / whatnot? Some of these have the really annoying habit of automatically throwing in these stupid filters, so you might be a victim of that. Looks like the kids may have done something to my iPhone settings – now reset! Thanks. Woops, no, only the Stansted photos were correct. Most others were still washed out beforehand. You can really tell the difference if you go through Instagram.